MOSCOW (AP) – Following in the footsteps of the U.S., Russia will abandon a centerpiece nuclear arms treaty but will only deploy intermediate-range nuclear missiles if Washington does so, President Vladimir Putin said Saturday. The U.S. has accused Russia of developing and deploying a cruise missile that violates provisions of the pact that ban production, testing and deployment of land-based cruise and ballistic missiles with a range of 310 to 3,410 miles. Trump’s move also reflected his administration’s view that the pact was an obstacle to efforts needed to counter intermediate-range missiles deployed by China, which isn’t part of the treaty. Russia has rejected the U.S. claims of violation, charging that the missile, which is part of the Iskander-M missile system, has a maximum range of 300 miles. Russian officials claimed the U.S. assertions about the alleged breach of the pact by Moscow were intended to shift the blame for the pact’s demise to Russia. 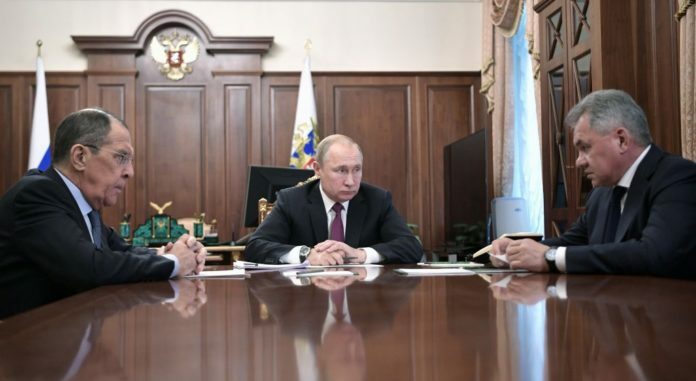 Speaking Saturday at a meeting with his foreign and defense ministers, Putin instructed the military to work on developing new land-based weapons that were previously forbidden by the INF treaty. Defense Minister Sergei Shoigu reported to Putin that they would include a land-based version of the Kalibr ship-based cruise missile and a new hypersonic intermediate-range ballistic missile.